In Virginia, saltwater anglers enjoy seasonal catches of Florida pompano. These delicious fish are caught in late summer from the surf, fishing piers, and near inlets. Florida pompano have oval, compressed bodies and a blunt snout. Adults have silver bodies with olive green backs and bright yellow coloration along their undersides and lower fins. 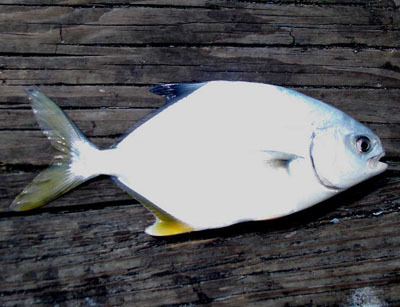 In most areas, bottom fishing is the most popular method for catching pompano. Anglers use a variety of hooks and leaders depending on personal preference. Small kahle or circle hooks are the most popular types for pier fishing, while surf anglers sometimes prefer long shank hooks that are rigged with floats. Many anglers consider mole crabs to be the best bait for catching pompano. Mole crabs are harvested in the surf, either by hand or with special rakes. When available, live soft-shelled mole crabs are preferred over hard-shelled individuals. Anglers usually pass the hook thru the crab’s back at a perpendicular angle to the body. A number of other saltwater baits are used for catching pompano, including shrimp, clam, crab, squid, and processed, scent-impregnated bait strips. In general, baits are cut into small pieces to match the pompano’s relatively small mouth. Occasionally, calm ocean conditions allow anglers to fish with “pompano jigs”. These small jigs are usually painted and dressed with brightly colored nylon hair. Anglers often tip pompano jigs with small pieces of shrimp before casting and working them along the bottom. Each bait, rig, and fishing method has its advantages and disadvantages. Several pompano bait-rig combinations are also effective on a wide range of species. Anglers often catch kingfish (whiting), spot, croaker, pigfish, flounder, and other species while fishing for Florida pompano.